1 Dash of hot sauce your pick! Preheat oven to 350 degrees and lightly wipe the jelly roll pan with the oil. Combine all the nuts in a large bowl adding all the ingredients reserving back 2 Tablespoons of the rosemary and 2 Dashes of Sea Salt for second round of coating after you pull them out of the oven! Roast the nuts for 20 minutes. Stir and turn every 5 minutes or they will burn! Serve them cold or warm, we like ours warm! We styled our Ridgeline Spicy Nuts in this cute 6 oz glass jar with a galvanized tin top from Target. This make great gifts at the Holiday time especially for men who sometimes are hard to buy for.....so I always bake or make for them. 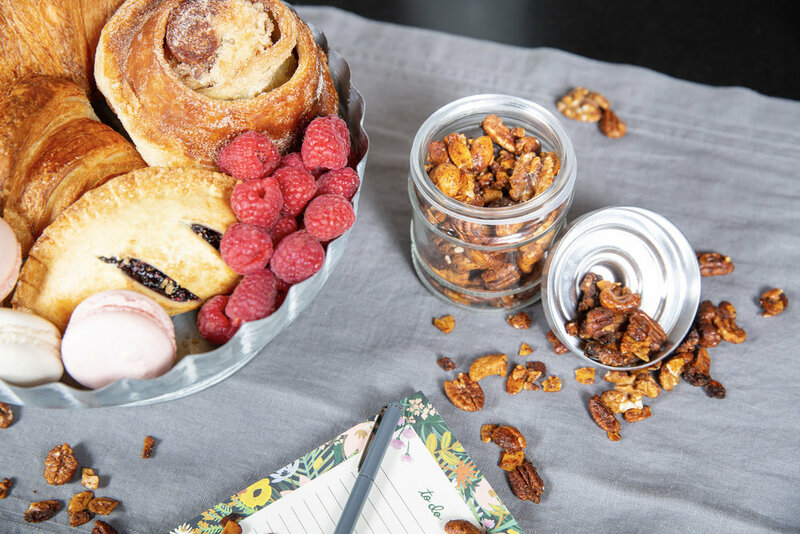 You'll notice our tasty items in the photo are from @persephonebakery. If you get the chance to visit our little town, you'll want to have more than one visit to this hotspot. Serving all types of European style (homemade) bakery goods, coffees, lunch items and wine. It truly is our oasis for coffee and baked goods. They are styled on a galvanized tin bowl from Michaels which could be used for so many things. Runs about $16.00. Our cute little To Do pad and matching pen is from @paperandgrace.